I realized recently that I don’t eat paninis any more. It’s kind of silly, since there’s really no reason not to. They’re easy to make at home; all you need is a big pan or griddle and a little bit of time. A griddle doesn’t give you the classic panini “grill marks,” but it toasts the bread and melts any cheese you want to add. And with fall weather creeping in, a hot lunch is starting to sound more appealing every day. 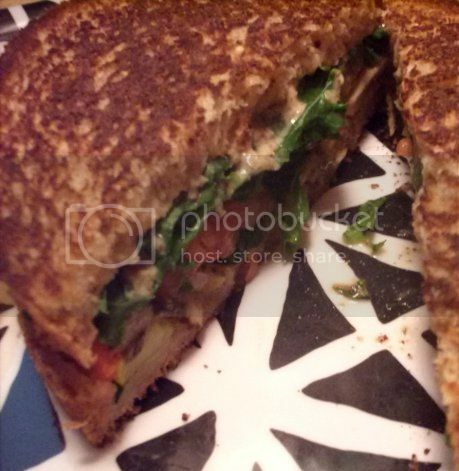 I made this sandwich twice last week, once with added Daiya mozzarella and once without. Which begs the question, can a sandwich rightfully be called a panini without cheese? In my estimation, earning panini status is more about crispy bread outside and warm filling inside. If some of the filling is melted vegan cheese, that much the better! 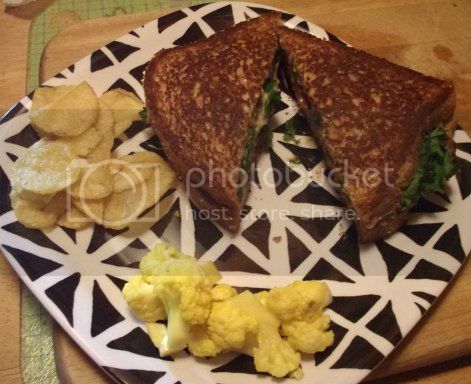 The sandwich is good either way, with spicy mustard adding something that holds its own when the cheese is absent. 1) Spray a griddle or nonstick pan with a little olive oil cooking spray and preheat over medium heat. Add the squash and mushrooms in a single layer. Spray everything with a little more cooking spray and dust it with garlic powder, Italian seasoning, and black pepper to taste. 2) Carefully turn each piece, spray again, and add more seasonings. Continue to cook, turning occasionally, until all pieces are soft and beginning to brown. Remove from heat. 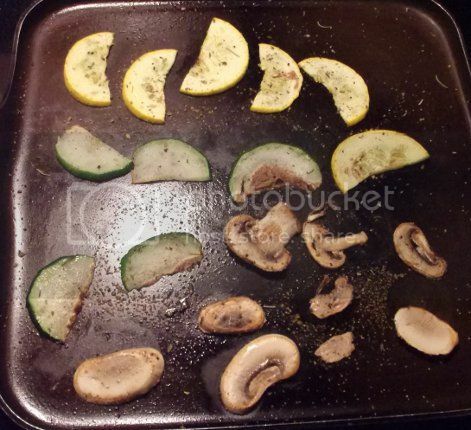 3) Arrange the squash pieces and mushrooms on one piece of the bread. 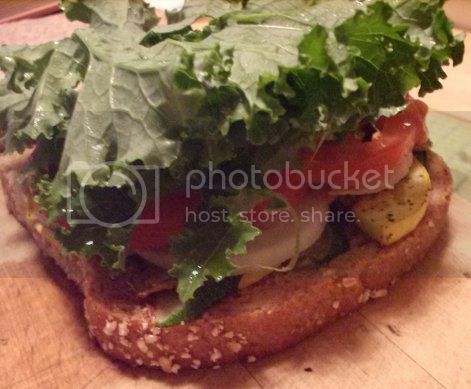 Top with onion slices, tomatoes, and kale. Spread spicy mustard on the other piece of bread and add the Daiya, if using. Put the sandwich together and push down a bit to get everything to stay. 4) Spray the griddle and heat again. (You might want to wipe it off a bit first to prevent any remaining spices from burning.) Add the sandwich and cover. Cook until it starts to smell toasty. Remove cover and spray the top of the sandwich with a little cooking spray. Flip the sandwich and cover again. 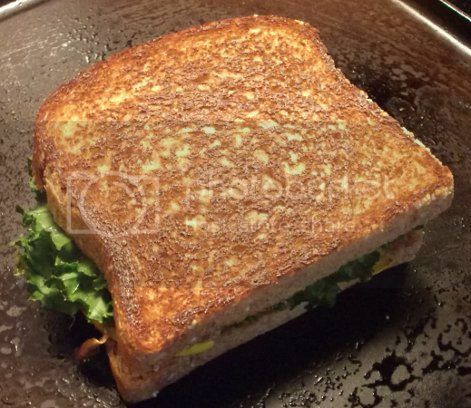 5) The sandwich is done when both sides are browned to your liking and the Daiya is melted. Serve warm with chips, pretzels, pickles, whatever!